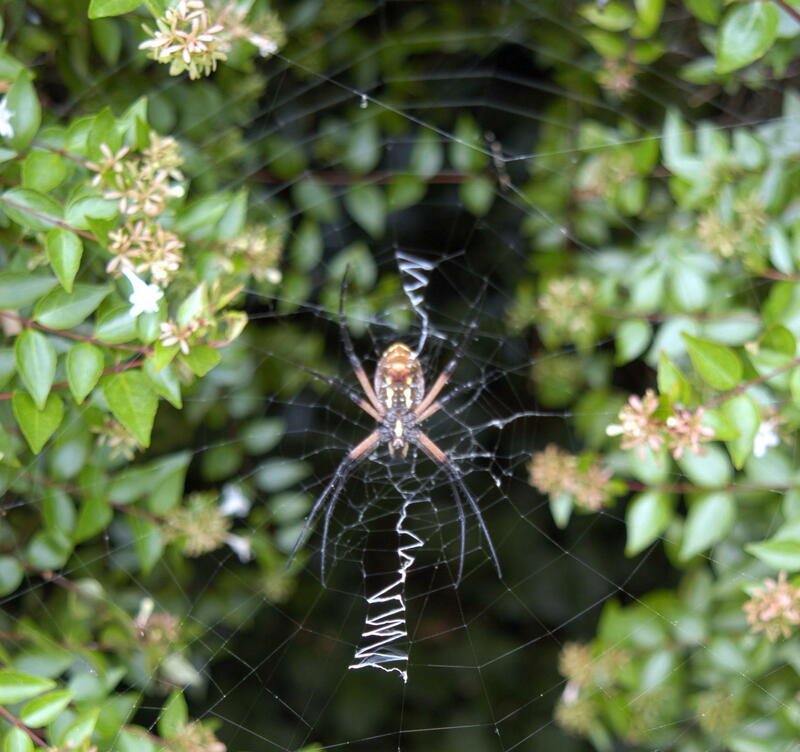 Argiope Spider, one of the garden's best beneficials. Common Name: The black and yellow argiope is also called banana spider, yellow garden spider, zipper spider, golden orb weaver and writing spider. 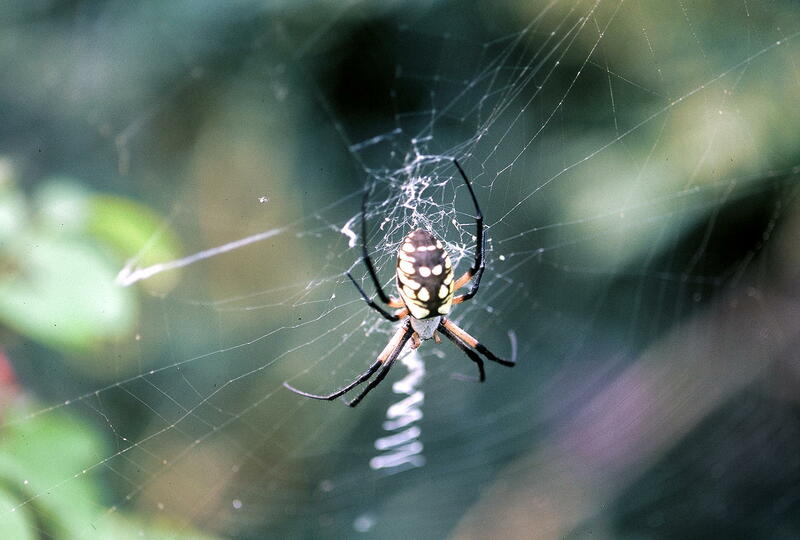 The largest orb weaver in our gardens is the black and yellow argiope (Argiope aurantia). The female is large, the males being much smaller by comparison. Although big enough to deliver a bite, these spiders are not poisonous or aggressive. Identification: Spiders are not insects; they have no antennae, eight segmented legs instead of six, as insects do. Many construct webs for capturing prey. Jumping spiders of the family Salticidae are colorful and leap to capture prey on the leaves. Wolf spiders of the family Lycosidae run rapidly on the ground to catch prey at the base of plants. Garden spiders or orb-weavers of the family Araneidae string vertical webs to trap flying insects. Funnel-web spiders of the family Agelinidae create funnel webs and trap leafhoppers primarily. Crab spiders like flowers where they blend in with the colorful petals waiting to ambush their next meal. Biology and Life Cycle: Males are often smaller than females. Not all spiders spin webs. Some live in tunnels. Most spiders lay eggs in silken sacs, which may be attached to the web or to twigs or leaves. Some carry the sac with them. Young are called spiderlings, look like adults, and are often cannibals. Habitat: Different spiders live in many different plants and habitats--beehives, wood scraps, fencerows, vegetable crops, and ornamental plantings. Feeding habits: Paralyze with venom and feed on insects and other small animals. Economic importance: Spiders are highly beneficial because they feed on many troublesome insects. Black widows and brown recluses are the only poisonous spiders, and they are very dangerous ones. Natural control: Mud daubers and other wasps. See Mud Dauber. Organic control: If a problem, knock the webs down with a broom. If they have to be killed, use soapy water or citrus. Vacuum thoroughly and often. Eliminate other insects--the spiders' food source. All but the black widows and brown recluses are totally beneficial. Yolanda” the yellow garden spider. Here are some pics of her. She’s been around my front porch for a little over a month. I have totally been fascinated with her!! Every day she has taken down her web, re-spun it and grown tremendously. I’ve watched her remove her web, hang the remains up on the side, re-spin her web, eat the old web and then make that incredible zig-zag “signature” when she’s finished – which, by-the-way – is ONE piece of silk that comes out. It’s much thicker than the regular silk that she spins for her web. Anyway, Saturday evening she was acting funny and caught a moth, pounced on it and devoured it. I had never seen her eat anything. Well, Sunday morning she did not remove her old web and re-spin it, which she did EVERY morning when the sun came up. (Took her about 2 -1/2 hours). Her web was tattered and all she did was do this vibrating thing and make the web oscillate or pulsate. Then she’d crawl around her web as if she were drunk. This morning she’s gone! I’m assuming she was pregnant because she got so big in the abdomen. Everything I’ve read says she’ll lay the eggs in sacs and then go off to die. I’m guessing that’s what’s she’s done. She left her web in a mess! It was so puzzling that she didn’t rebuild it yesterday.